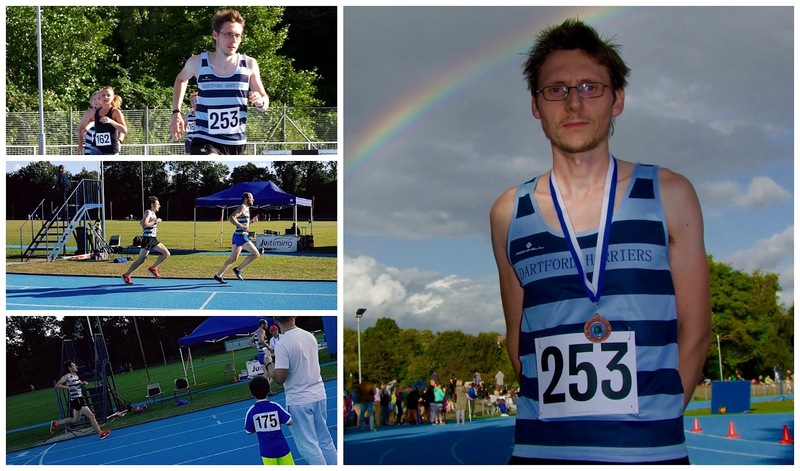 The Dartford Harriers Club Champs are held each year at the end of the track season and is an informal event which lets athletes compete in any event they wish. It's a great opportunity for runners to try their hand at a field event and vice-versa. Even though it is informal and friendly, the races are all officially timed and included on the Power of 10 website [my athlete page]. Although the opportunity was there I decided to play it safe and stuck with the track for my events. I had put my name down for the 400 metre and the 1500 metre races. We wandered over to Central Park Athletics Arena with plenty of time for me to collect my race number and we found a decent spot to hang out and watch the proceedings. 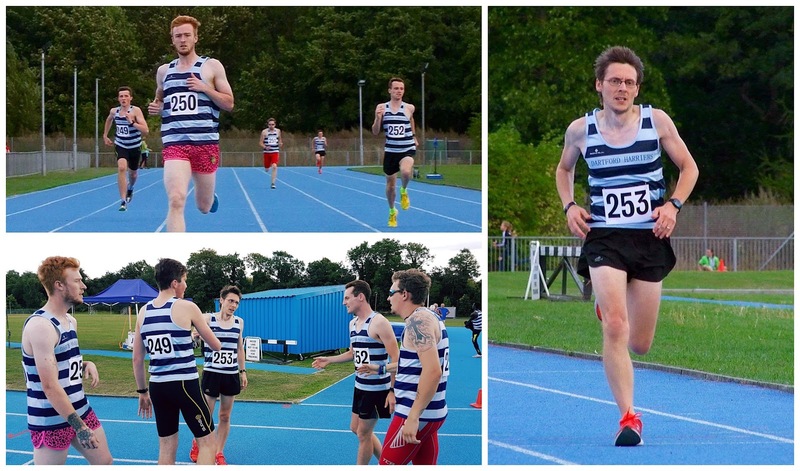 My first race was the 1500 metres, a distance I had never raced before. Although I have done enough 1 mile races to understand what it would be like. Three and three-quarter laps of the track for this race. The starter's pistol was fired and I headed over the inside lane and settled in nicely behind my team mate Matthew. The pace felt a little easy through the first couple of laps, but I felt like staying in the position I was in would be best. It crossed my mind a few times to move past my team mate, but I think I was held back because he is a faster runner than me and thought it best to stay behind and trust that he'd drag me along to a quicker time. 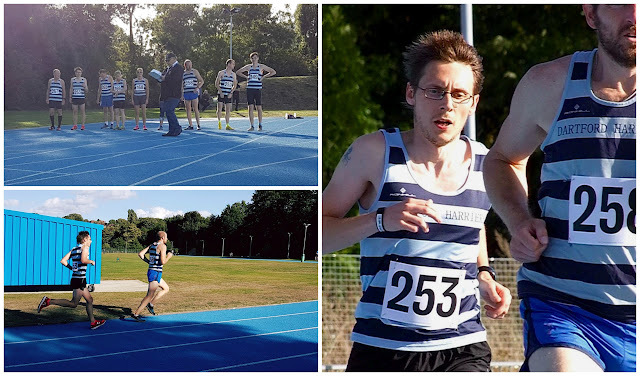 Had I been alone I would definitely had run those middle laps harder, but I didn't and I followed my team mate right to the end in an official time of 5.24.87, which was roughly around the time I had thought I would run. In retrospect I think I should have bitten the bullet and pushed ahead on lap 2 or 3 to see what would have happened. After the race, I had about 21 minutes to rest before the 400 metre race was due to start. For this one each runner is assigned a lane and the start points are staggered around the first bend. This is where I was seriously out of my league! Most of the runners here were track specialists whereas I really am not. I was assigned lane 2, which was a familiar place to be as this is the lane I train in when I run my track sessions each week. However it was clear from the moment the starter's pistol was fired that I would be trailing the others by a significant amount. I ran a 400 metre race in the early summer of 2015 in a time of 67.5 seconds so I had that in mind as a rough time to aim for. However it was a little windier at this event and I was almost blown into lane 3 as I rounded the final bend. The last agonising 100 metres were into the headwind and I knew that I'd be a few seconds adrift from that target. 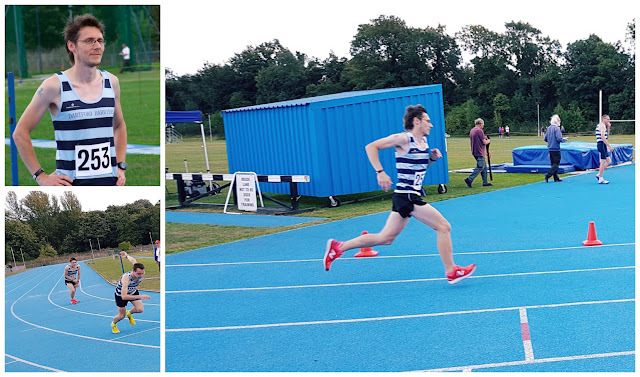 My official time was confirmed as 70.29 seconds and I was just happy that I could now stop running at such a hard pace and focus on training for the forthcoming cross-country season. We'd had a nice afternoon out at the club so thank you to everyone that worked hard to make it happen. As a bonus I got a bronze medal in the 1500 metre race for finishing 3rd senior male - to be fair there were only 3 senior males in the race, but it was all for fun and it's nice to have a little memento from the day. Thanks to Dani and to Richey for taking the photos I have used here.